GRAPES : Chardonnay, Pinot Noir, Pinot Meunier. The colour of the wine is an intense gold with fine effervescence that signifies long maturation on the lees. On the nose, the wine initially displays notes of hawthorn and white flowers, which are followed by aromas of toast, marzipan and ripe pears. On the palate, the wine is full-bodied and elegant with the freshness of Chardonnay and richness of Pinot Noir. Overall, the wine is well-rounded with a fruity finish. As an aperitif or with fish dishes salmon, turbot, John Dory, poultry and white meat. Sensual and delicate woody nose with flavors of cherry, red berries and Asian spices. Flattering and round in the mouth, with notes of pomegranate and hints of vanilla. Amazing on its own, but truly expresses itself with a nice red meat, such as carpaccio. This brut champagne is the first label of the Charles Legend champagne house. The extended sun exposed grapes attributes to this champagnes a fruity and balanced taste but also the refinement of great champagnes. light and sharp with perfumed notes of citrus and yellow plums called mirabelles Excellent as an aperitif, or paired with oysters and seafood. GRAPES :Cabernet Sauvignon, Cinsault, Syrah, Grenache. Situated between the Mediterranean and the Alps, in the heart of Provence – the painters’ paradise as portrayed by Van Gogh and Cézanne, LES QUATRE TOURS has been producing a palette of superb wines, rich and generous as the colors of the south of France for over a century. Great on its own. Perfect match with cooked or grilled vegetables. Also great with salads, pâtés, cold meat or cooked ham. A gem with most light fruity desserts. An elegant match for mixed fish, delicate starters, white meats, salads, vegetable flans and soft cheeses. Vergisson gives its name to this lively Macon-Villages Chardonnay. Situated on the flanks of the the Roche de Vergission and with the rock at Solutre as a backdrop, this is one of the prettiest corners in the Maconnais. This is a charming wine, natural and fresh with the mineral persistence of a full-fledged Pouilly-Fuisse. It’s a weighty Chardonnay, with lemony and buttery notes, and hints of apricot and peach. Good acidity, with a driven edge and a long mineral finish. Citrusy nose with some notes of white peach and pear evolving towards flinty and gunpowder aromas. The mouth is very well balanced with a great acidity which brings length to the wine. Very expressive, elegant and complex Riesling. To be served as an aperitif, with fish, shellfish, white meats or goat’s cheese. Dry and nervous in its first year and progressively smooth with the passing of months. White blossoms, box of citrus fruits. Rich on the palate. Fresh and lively aromas of passionfruit, limes and floral notes. Vibrant palate with delicious ripe fruit, finishing with great balance and concentration of flavours, classic Marlborough Sauvignon. A fresh and lively sauvignon perfect as an aperitif, or serve with lobster bisque, crab cakes or smoked salmon. Also great with creamy chicken and pasta dishes. Full yellow colour; has an elegant bouquet with a graceful, bright air of white fruits, summer flowers, cooked oranges and hazelnut. The palate is lovely: the fruit and the richness walk hand in hand, and there is a natural freshness bound into its ripe setting. Great with white fish like cod or monkfish and chicken. Frog legs would be a must. Matches most mushroom based dishes. Golden colour. Nose of white flowers, grapefruit, fresh almond and apricot evolving towards hazelnuts and dried fruit. The mouth is rich with some peach and toasted notes. Finishing with minerality. TPair with full flavoured fish like mackerel, salmon and white meats in a cream sauces. GRAPES : Syrah, Grenache, Mourvedre. Dark violet in colour. Aromas of white pepper, black cherry and cigar, before a fresh hint of kirsch. The wine is drinking perfect now but still has some tannins which will allow it to age beautifully in the years to come. Pairs well with grilled or barbequed red meats as well as spicy or smoked dishes. With bold fruity flavours, this wine has a complexity that is typical of Malbec. Spices from the rich clay soils and the bold flavours together make a deliciously balanced wine. Goes well with steak, venison, and a roasted pork. A must with earthy dishes. This Bulgarian Pinot Noir offers the nose black and red cherries and dried violets. It is well balanced in the mouth with soft, rounded tannins and flavours of dark cherry, cranberry and dried Mediterranean herbs. GRAPES : Cabernet Sauvignon, Cabernet Franc, Merlot. Dense garnet color with haloed purple highlights. Heady aromas of red fruits entangled in menthol and spice. The taste is structured and greedy, like a giant fruit basket. Steak, grilled vegetables, lasagne, roast duck, veal loin. GRAPES : Cabernet Franc, Cabernet Sauvignon, Merlot. A very aromatic bouquet blending fruity notes such as raspberry and blackcurrant, jammy fruits like plum and vanilla notes. The tannins are quite velvety, the mouth is round and well balanced. Long finish. A grand wine, almost crunchy, which will reward with a little time in the cellar. Ideal with red meat and lamb. Perfect also with pork stew and hard cheeses such as Comte or Beaufort. GRAPES : Cabernet Franc, Syrah, Sangiovese. Wonderful aromas of blackberries, blueberries and flowers follow through to a full body. Mineral undertones. Dense and full in the palate, with velvety tannins and a fruity finish. Pairs well with a wide range of first courses as well as full-flavored pasta and risotto dishes. Great also with beef fillet and pork or also vegetable stew such as ratatouille. Excellent with mushrooms and hard and semi-hard cheeses. Light red in colour with aromas of cherries, raspberry and nettle. Young red fruit coming through on the palate. Best drank young but can last up to five years. Goats cheese, chicken and root vegetables. On the nose wild hedgerow, black fruit and even a touch of cedar. The palate is medium-bodied with a supple core of pure red berry fruit mingling with minerals – a stony character to this wine – very expressive and animated. The finish is refined and displays superb length for a second wine. Great with beef dishes or Thai aromatic curries. 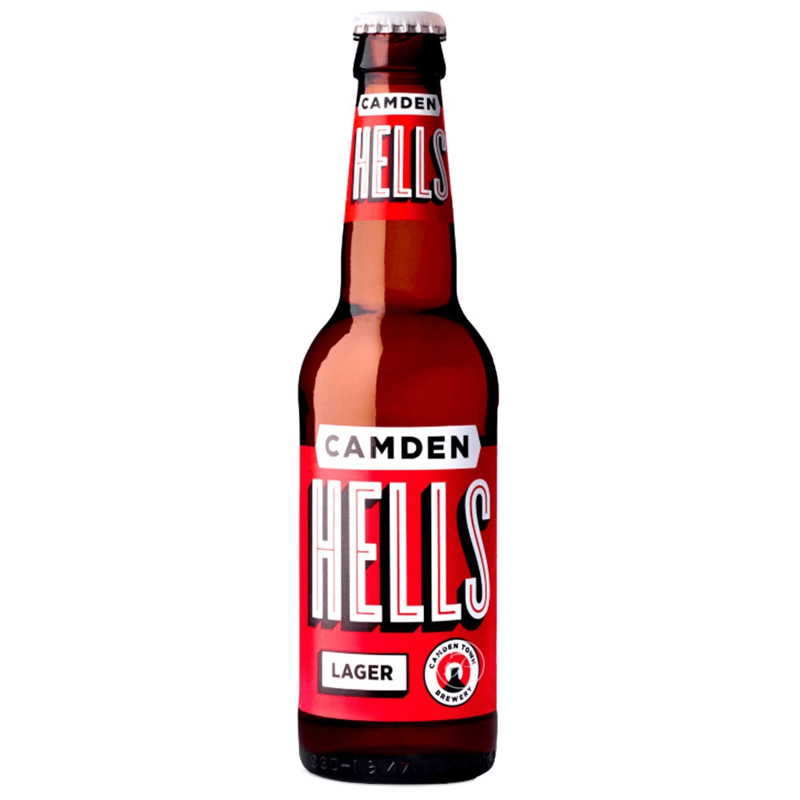 The one that started it all for Camden Town Brewery: The Hells Lager. Notes of lemon, orange and some spicy herbs are complemented by sweet caramel and biscuity notes from the malts. Finishing crisp, dry and clean, this hybrid between a Pilsner and a Helles lager is nicely balanced and straightforward. Camden Town Brewery’s Pale Ale is a proper lesson in trans-Atlantic relations. A zingy American hop profile with juicy citrus and spicy resin notes is laid on top of an elegant English-style maltiness. Its smooth mouthfeel and restrained bitterness are a refreshing finish to this drinkable, un-shouty Pale Ale.